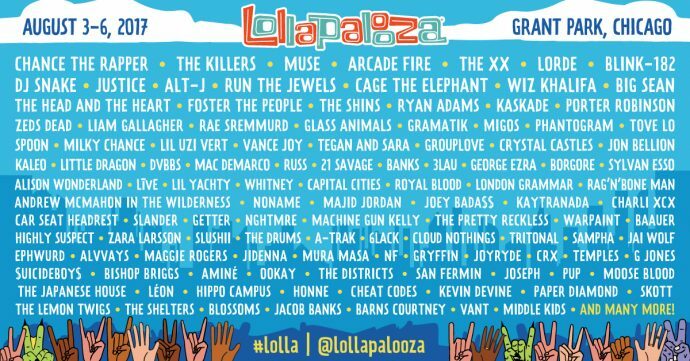 Lollapalooza had humble beginnings as a Jane’s Addiction and friend’s tour in the alt-90s, but it has now morphed into a massive gathering of upwards of 500,000 music fans who have one goal in mind—to enjoy as much glorious music as possible in a four-day span….oh, and to do some pretty heavy day drinking. As tons of music fans make the big neon tank top and flower crown migration to the windy city, it is time for StGA to choose the top ten acts that we are most stoked to see at this year’s festivities. It is not often that you see a child-star go rogue and it not end up being a complete mental case. However, Taylor Momsen of previous The Grinch Who Stole Christmas and Gossip Girl fame did exactly that when she ditched the Abercrombie & Fitch threads for leather, chains, latex, and some impressive metal vocals when she created the band The Pretty Reckless. They actually have some great songs and a huge fan base, plus this is about as metal as you are going to get at Lollapalooza. After a disappointing release week of his debut album, Teenage Emotions, we haven’t heard much from Yachty, except on a weird collaboration he did with Macklemore recently. I personally thought his album had potential, but was all over the place. Since he wasn’t able to translate through an album it will be worth finding out if he can translate well to a live audience. “New hair, who dis?” Fresh from selling one million records from his breakout single “Prblms”, the alternative R&B singer has chopped off his notable dreadlocks. As he moves on into this new chapter in life and ascends farther into the sky of success, it will be interesting to see what new material he could possibly present at his set. Will Crystal Castles play any of their old songs? Is the new singer, Edith, a good replacement? Does she have a stage presence of her own or is she simply a fan from Tumblr in an Alice Glass costume? We will find out on the next episode of Dragon Ball Z…or when we attend their set at Lollapalooza. The Nigerian hip-hop artist first caught our eye with the hit single “Classic Man”, and since then he has put out some more solid work. His eccentric nostalgic style and perfectly coifed ginger hair complement his sultry and melodic tunes well, so it will be nice to see how his music translates to a live and often restless audience. “Doitlooklikeiwasleftoffbadandboujee?” To say Migos have been on top in 2017 would be an egregious understatement. Quavo, Offset, and Takeoff definitely have the formula to make a hit, so this will definitely be one of the most anticipated sets of the weekend for sure. There also are rumblings that they are gearing up to release their next album, Culture 2, so we could be in for some new tunes. 21 Savage is another Atlanta rapper who has been winning this year. From being a 2016 XXL Freshman to finally releasing his successful debut album, Issa, he has made some big moves this year. 21 Savage seems to have a very laid back demeanor, so I can’t wait to see if that changes when he performs. Say what you want about Swae Lee and Slim Jxmmy, but you can’t deny that these two have an infectious energy. They know how to get a crowd lit, and you will be hard pressed to find a more excitable crowd than the Lollapalooza bunch. I anticipate this being the most high-octane set of the weekend. I remember back in 2009 when I attended Northwestern University’s annual Dillo Day festival. N.E.R.D headlined that day, but an unknown rapper named Big Sean hit the stage early on in the day and made his rounds in the crowd afterwards. I spoke to him briefly and he was a notably nice, humble, and polite gentleman. Now, he is headlining Lollapalooza and I must say that I can’t think of anyone who could deserve it more. With a great album under his belt, I imagine he will be bringing out some surprise guests and should offer an unforgettable performance. If you read our review of All Amerikkkan Bada$$ then you know how much we thoroughly enjoyed it. It got one of our highest scores of the year due to its sonic cohesion and important social commentary. Assuming that he will be performing most of the songs from this album, it will be refreshing and fascinating to see such conscious songs performed at such a mainstream festival.